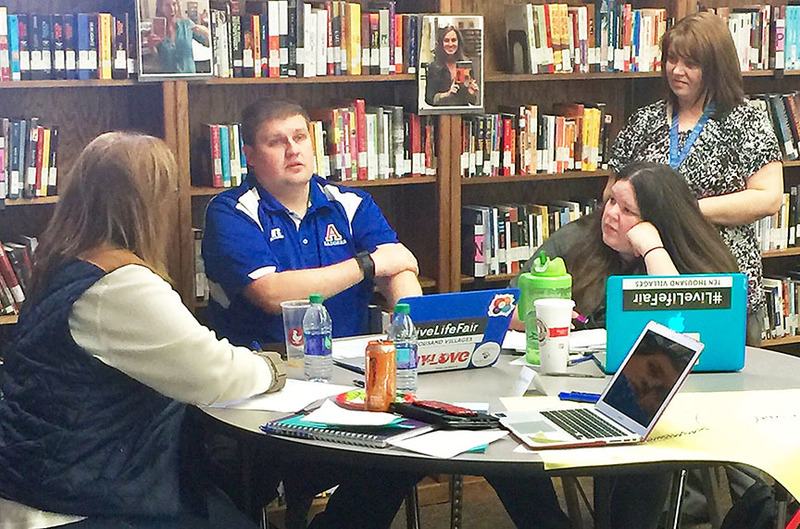 Robin Sneed, director of Blytheville High School New Tech, listens as educators from Arkadelphia revise their leadership structure during a panel discussion that was part of BHS’ “Take Me to Your Leader” New Tech Site Institute on Jan. 26 inside the school’s library. In addition to Sneed, the Institute was hosted by New Tech educators Michael Davis, Amanda Haynes, Virginia Andrews and Tyler Isbell. The original proposal for the Site Institute was created and submitted to the New Tech Network by Teryn Spears, former BHS New Tech director who had been encouraged by New Tech coach Julia McBride, who worked closely with the BHS New Tech teacher leaders during the 2015-2016 school year and recognized building teacher leader capacity as one of the strengths of BHS and New Tech schools. “It is quite an honor our proposed Site Visit was accepted by the New Tech Network,” said Sneed. In the session "What's the role of teacher leaders in sustaining the New Tech transformation? ", Sneed said that participants learned about BHS New Tech’s experiences in building teacher leaders, assessing their current approach to teacher leadership and building plans for future teacher leadership opportunities. Sneed and her teachers designed the institute with New Tech’s Project Based Learning model in mind, including in the day’s work an “Entry Event”, a chance for participants to share ‘knows’ and ‘need to knows’ concerning teacher leadership, an end-product goal, both whole group workshops and optional mini-workshops, project work time and a chance to use the Critical Friends protocol to get feedback on their work. Participants even had access to a project briefcase and agenda in ECHO, the same online Learning Management System that all New Tech students use daily to submit assignments and access grades. BHS student ambassadors Hollis Abner and Kentrell Bobo greeted the guests and provided them a brief overview of the facilities, and then led them to the school’s library, the location of the Site Institute event. "One of the focuses in the Blytheville district is to build capacity in teachers and allow them to step out using their expertise to lead others," said Curriculum director Sally Cooke. "BHS has been a great example of how successful this can be, and it is great that the New Tech Network noticed what is taking place and wanted them to share it with other New Tech Network schools." "When teachers feel supported and know that they have a voice in the decisions that are made, they are happier and more successful as educators. We have worked hard in Blytheville to create a system in which everyone is a learner - students, teachers and administrators - and we provide a variety of professional learning opportunities throughout the district so our teachers can continue to develop new strengths each year. This in turn helps us to keep strong teachers in the district because they know that it is a great place to work."